What Car Matches Your DISC Personality Style? How does my DISC personality type influence the car I drive? When you see yourself driving on an open highway with nothing but the horizon ahead of you, what car really sparks your interest? What makes you feel most comfortable? 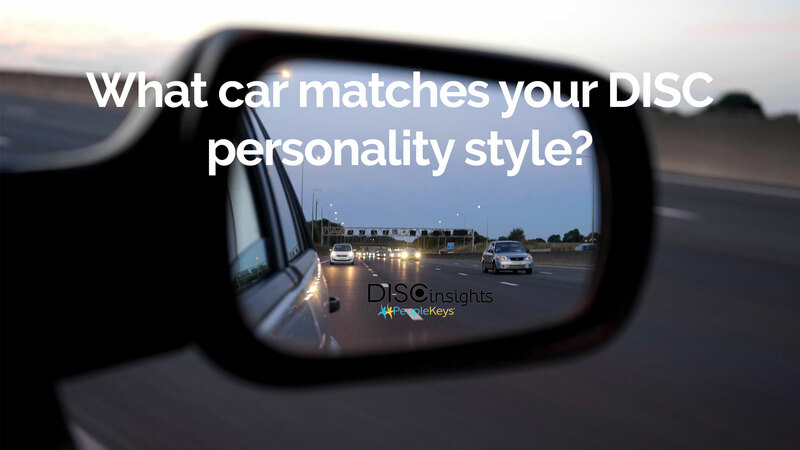 Your DISC personality style might have something to say about what kind of car you see yourself in. Whether it’s for fun or function, you want to make a choice that is meaningful for you. A "D" personality will buy the biggest, baddest machine made for driving. After all they are the leaders in all things, including the road! A large, black sport-utility vehicle, truck, or beefy crossover will cover all the bases. Plus, they will sit above everyone else on the road and be able to navigate to their destinations more effectively! If you hear the big, bassy boom of a souped up audio system, you can bet the D is blowing off some steam on their commute. When your “I” friend sails down the boulevard, you will likely take notice of their sporty red convertible or sassy sports car. They may even opt for some shiny chrome embellishments or vanity plates so that everyone notices their road presence. Don’t worry, they will slow down enough to pick you up and tell you all about their latest trips across town and who they ran into! Enjoy dance music or the latest pop station on your drive as your hair blows in the wind! An "S" DISC type wants to bring their friends and loved ones along for the ride in comfort. A minivan or station wagon will get the job done! If you live in a snowy climate, one of those roomy crossover vehicles will ensure that everyone makes it to holiday dinners on time. Plenty of space for everyone to stretch out and enjoy a family trip together is essential! Because safety is important, especially with precious cargo, a high safety rating is in order. Having a good sound system in your vehicle is great for family sing-alongs. If you are considering a new car purchase, you might want to enlist your "C" friend to help. A C personality type will have the gas mileage, safety rating, and long-term performance data ready for shopping day. After all, a car is a big purchase and having all of the facts is essential. You might find a C driving around town in a white, blue, or silver Volvo or Saab, having chosen reliable and long-lasting cars. If they are particularly environmentally conscious, you may see them driving around town in a Prius. Music at a reasonable level can make your commute so much more enjoyable!